I took this photo not knowing that over the next 2 days 2 of the chicks pictured would be found dead on the ground below the nest. 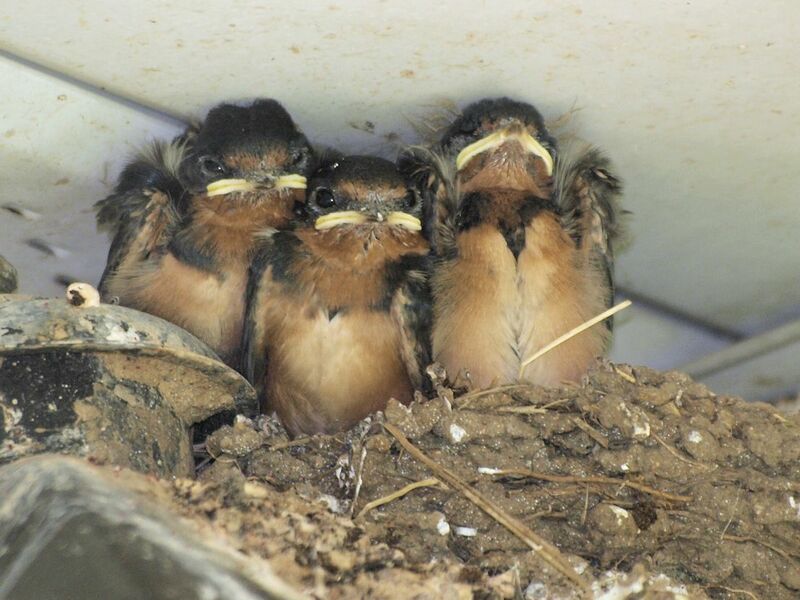 One of these birds would leave the nest but hang around on the ground for a few days until it gained enough strength to finally fledge. 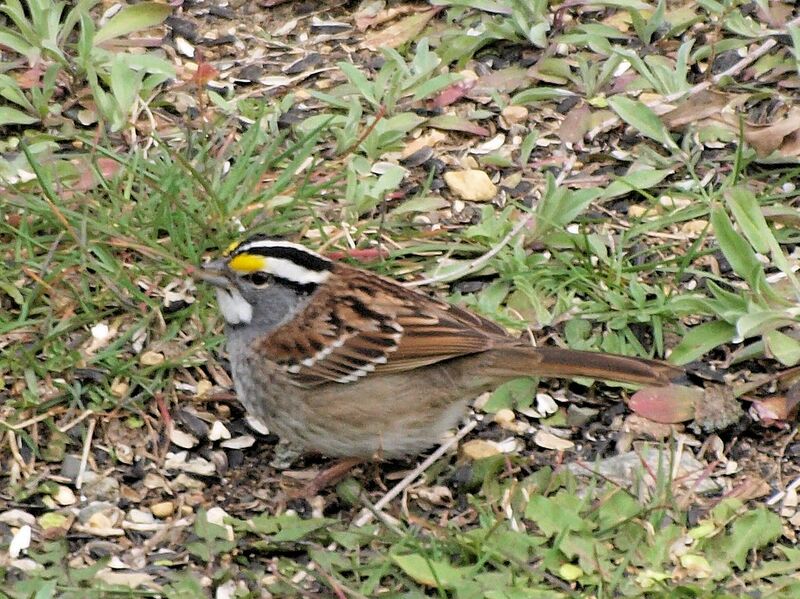 On Friday evening we saw this bird on the ground by Shawnne’s flower/vegetable garden. Both of us tried to place it in a safer location but the bird would have none of it. We were sure it was going to die, but next morning it was on the ground very much alive. 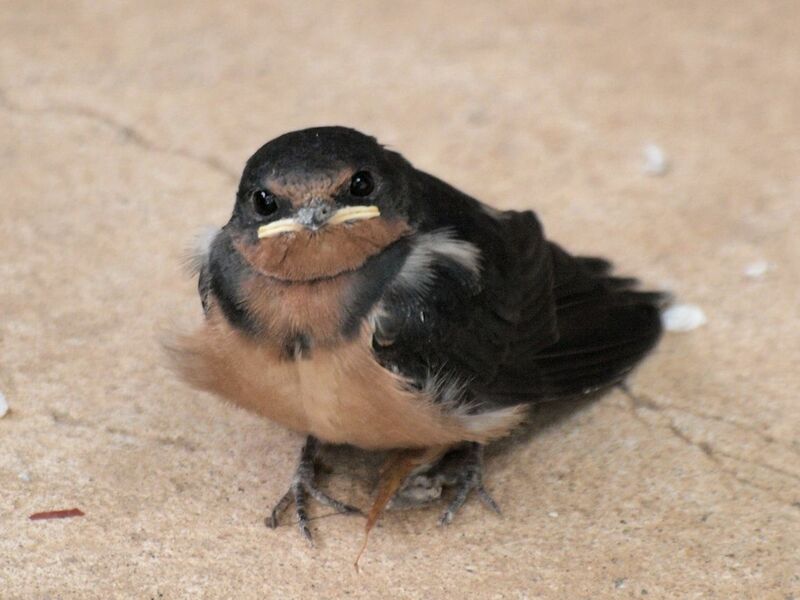 Its parents were feeding it and chasing off probable attackers. Lucky for us there are no cats and that Sierra is long past chasing anything. After the bird left our front steps it was in the bushes by the driveway for a day or two. 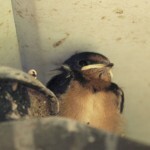 After that it seems to have fledged successfully. Sometimes there really is no place like home. Gas prices are down but they are still 60 to 80 cents higher than in 2010. Summer weather is here and we don’t like taking long walks in the really hot weather. The state parks this time of year are crowded and noisy so we have been avoiding them. 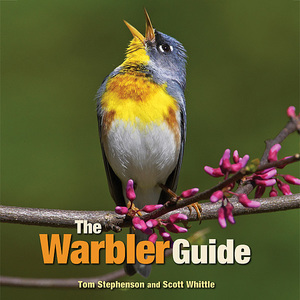 We have been taking short trips on local roads near our house and we have been surprised at how much good birding can be done in a short period within 5-10 miles of home. 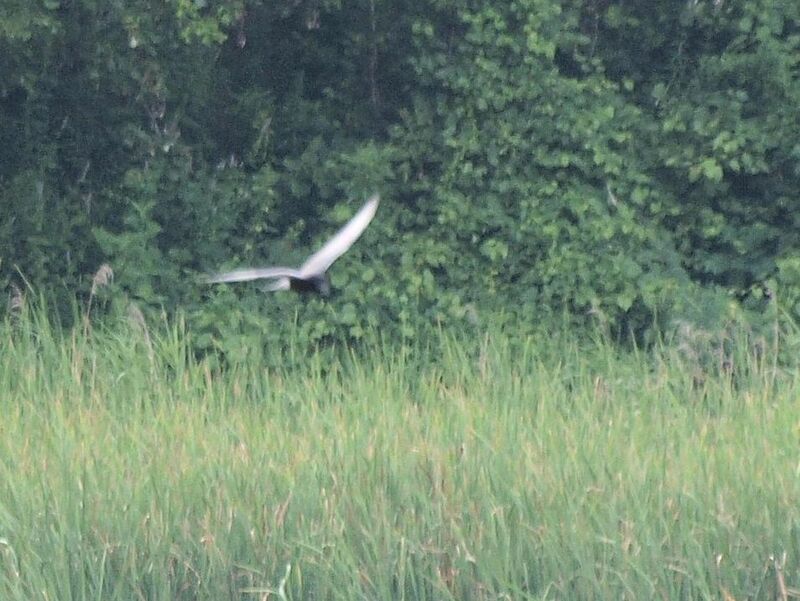 Just 2 days ago we saw a Black Tern only a few miles from home in a small secluded lake. This is not a rare bird, but you needs to be looking in the right habitat. Please excuse the poor photo but it was the best of the bunch. There is a road we travel every time we go North or East from our house (if we go to Brainerd, St Cloud, Little Falls etc.) so we have passed it numerous times in 23 months. 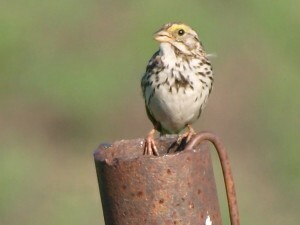 Still just in the last 2 weeks we have seen Bobolinks, Dickcissels and a lone Savannah Sparrow. The Sparrow is easy to miss but the Bobolink is not and the Dickcissel sings loudly so if we had ever stepped out of the car I am sure we would have heard it. Below is a picture of the Savannah Sparrow, it looks a lot like the Song but if you see it close up it is clearly different. April was a disappointment. We had a rush of birds coming in during the middle of March until the end. That coincided with unexectedly warm weather. 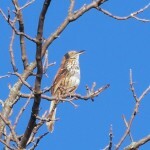 35 birds made their first appearance for 2012 in March. We expected more for April. 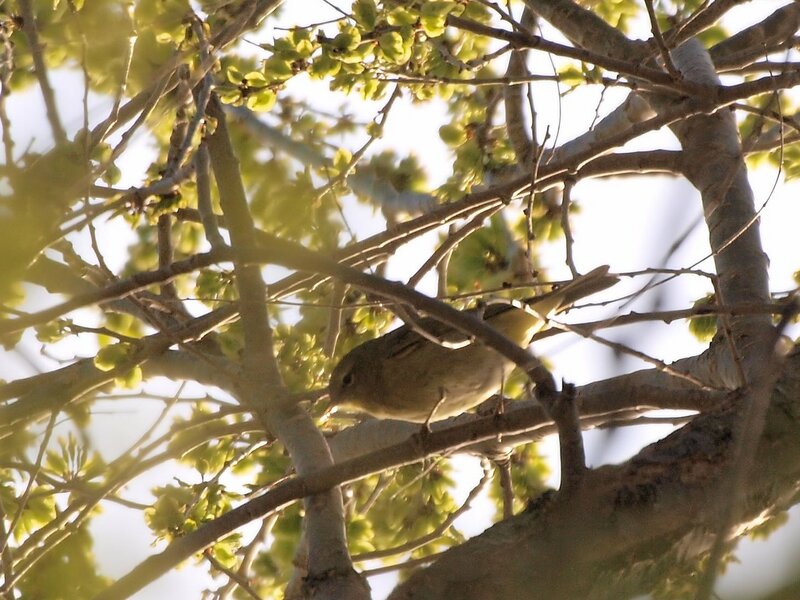 We were hoping to get a larger group of Wood Warblers earlier than we did. 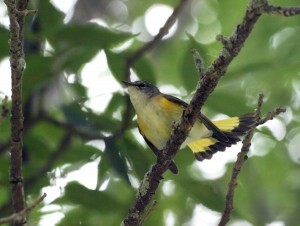 We had only 3 early Warblers: the Yellow-rumped, the Yellow and the Tennessee. 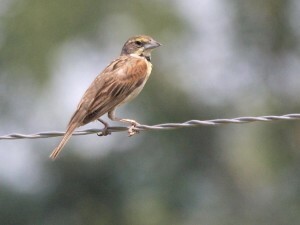 April 2011 had been a very good birding month, April 2012 only brought 14 new birds. That does not mean we weren’t busy. 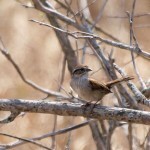 We saw about 29 birds per day. 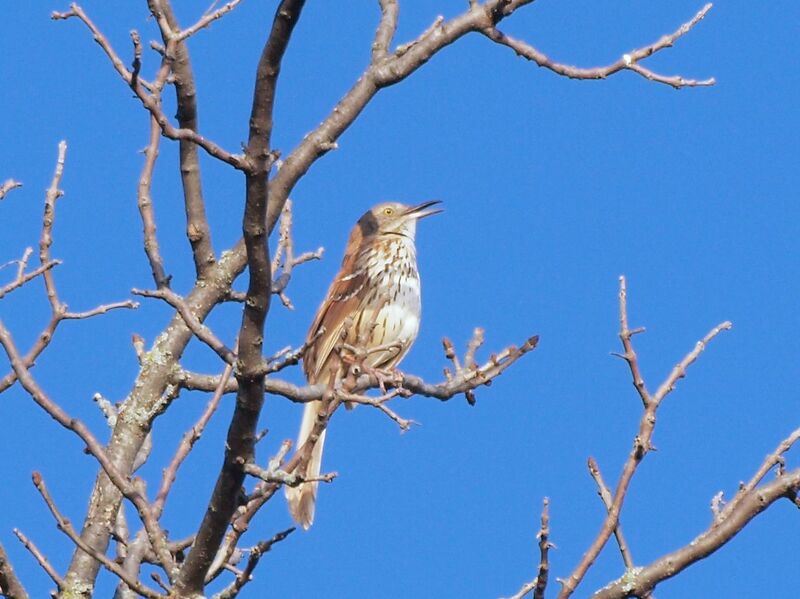 We did have one new bird (new for us anyway). 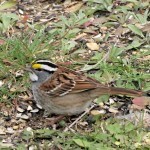 We saw a Lark Sparrow in Lake Maria State Park on 4/25/12. 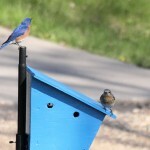 Last fall we setup a second post for a Bluebird house and it appears that we have a breeding pair this year. Now that May is at hand we are expecting a very busy month. 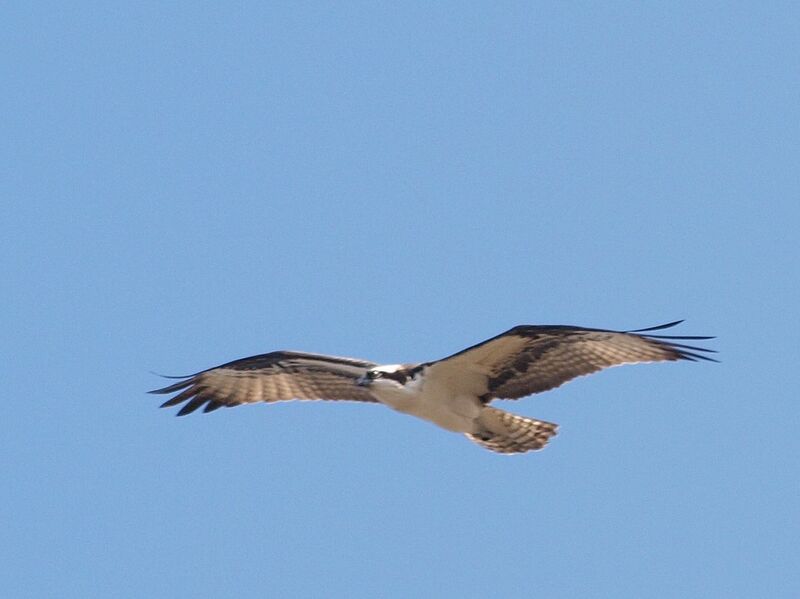 We live on a lake, so it is no surpise that we have had a pair of Ospreys nesting very near to our house. Still we were worried this year. 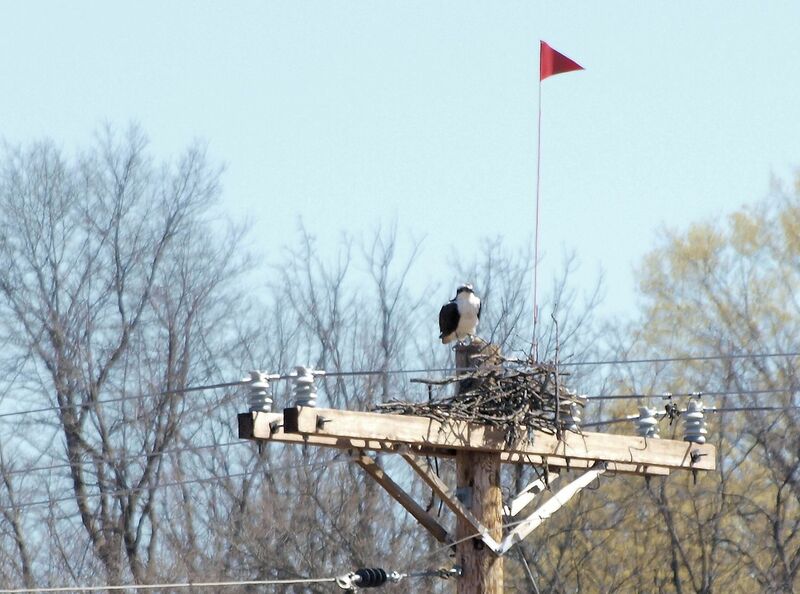 The Osprey pair was using a nest that was at least a few years old. 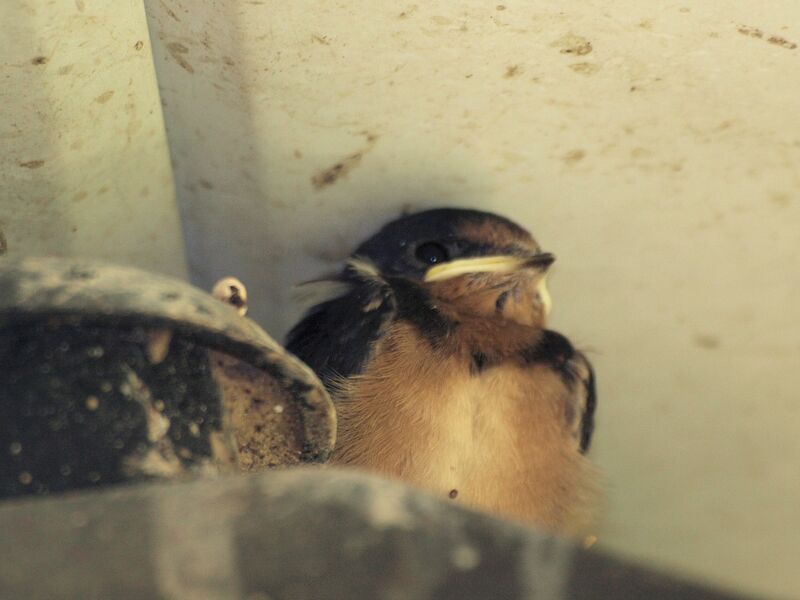 Last fall the local power company had to remove that nest in order to do some repairs. Given the very early start of Spring, I had expected to see the Ospreys return in March, but none of them showed up. 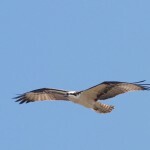 We saw our first Osprey last Saturday afternoon 4/7/12, but there was no move to start a nest. 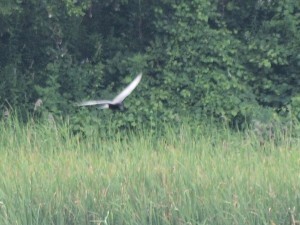 The pair flew over the lake and left. 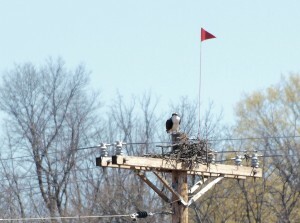 Yesterday, though it appeared that the Ospreys had chosen the same location (the flag was erected by the repair crew). As you can see they Ospreys are making a start even if it appears to be a slow start. 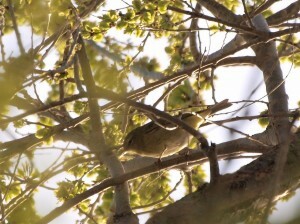 The photo is mediocre (the bird doesn’t like to be approached) but it does show bird. 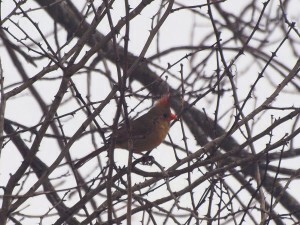 Here is a photo of the female Northern Cardinal. 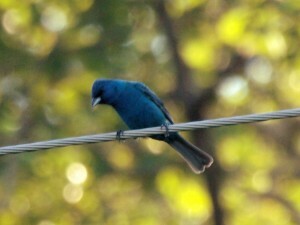 It is a common bird, but for some reason it only appears at our feeder station close to dusk. 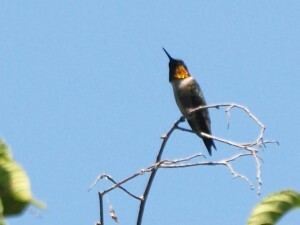 In the last few weeks the male has come around 5:45. The female seems less devoted to a schedule. This one was taken at 4:40 in the afternoon yesterday. This photo was taken through 3 layers of glass, so much of the resolution of a decent camera is ruined by the extra layers of glass. In the years we lived in Randall, we would see our last Bald Eagle in December and then usually not see them until March. 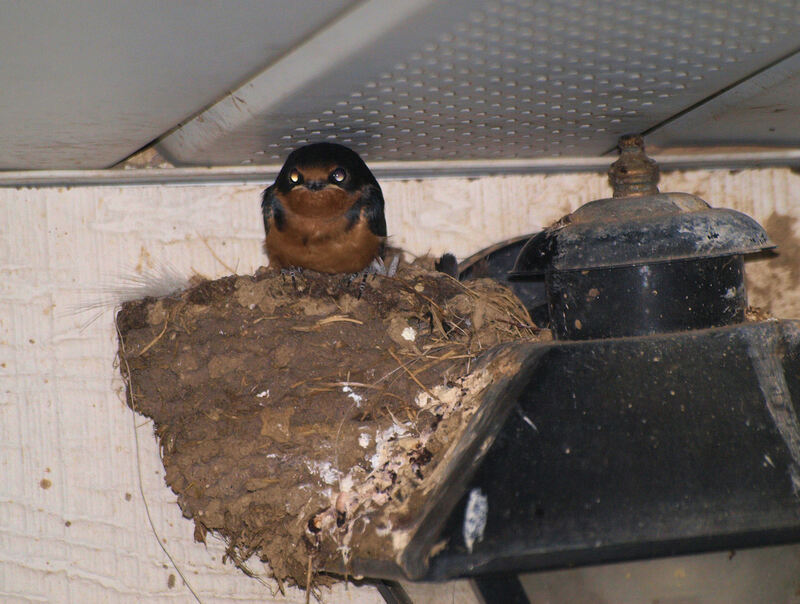 For the last 2 Winters we have been in the rental house near Long Prairie, and we have seen them all through the fall and winter. We have seen them 3 times in the last 2 weeks (twice while walking Sierra after work). Unfortunately I have not had my camera when the Eagles have made their appearance. I assume the warmer temperatures are driving the Eagle’s behavior. When I lived in NJ, the Eagles would be visible in the Winter once the Northern water’s had frozen. In Minnesota, I don’t know whether that is true. Certainly there isn’t much open water even if our weather is far warmer than normal. Are we going to have an early Spring? The temperatures are warm, as much as 8 degrees about normal, this year. Some of the Chickadees are singing. The Red-bellied Woodpeckers have been very active of late (not that I know what their activity means). 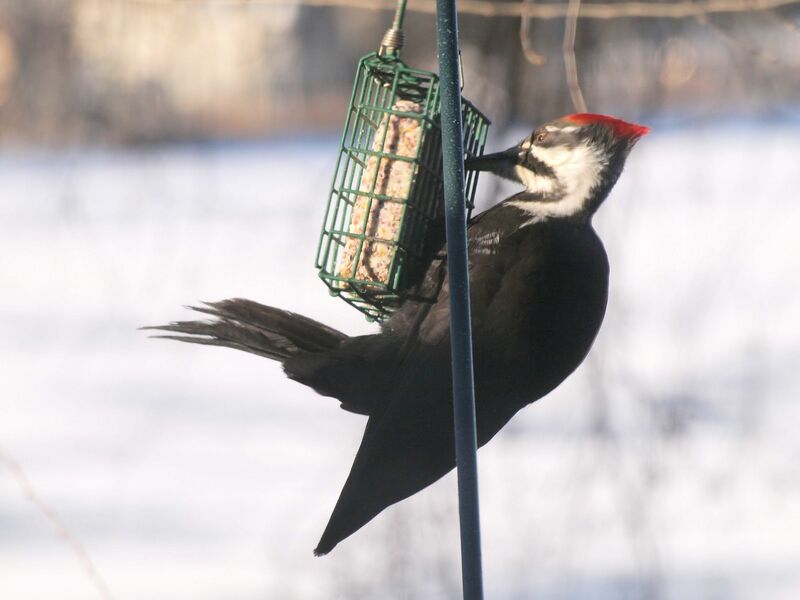 Below is a photo of a female Pileated Woodpecker. Taken through 3 layers of window glass. 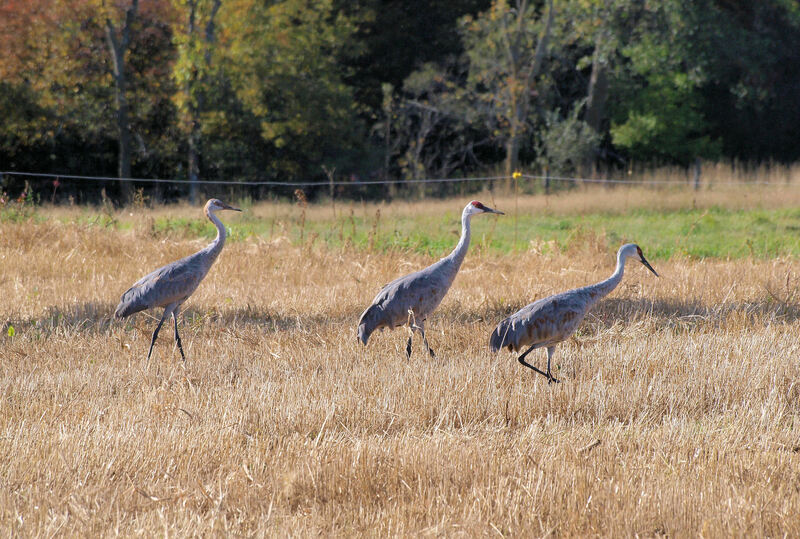 One of my favorite birds to see here in MN is the Sandhill Crane. They are beautiful and fun to watch. 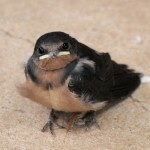 While we have heard them all summer, they have become very vocal. Over the past few weeks, we have been hearing them call in the fields across from us. Often you can see them while driving through the countryside, in fields. 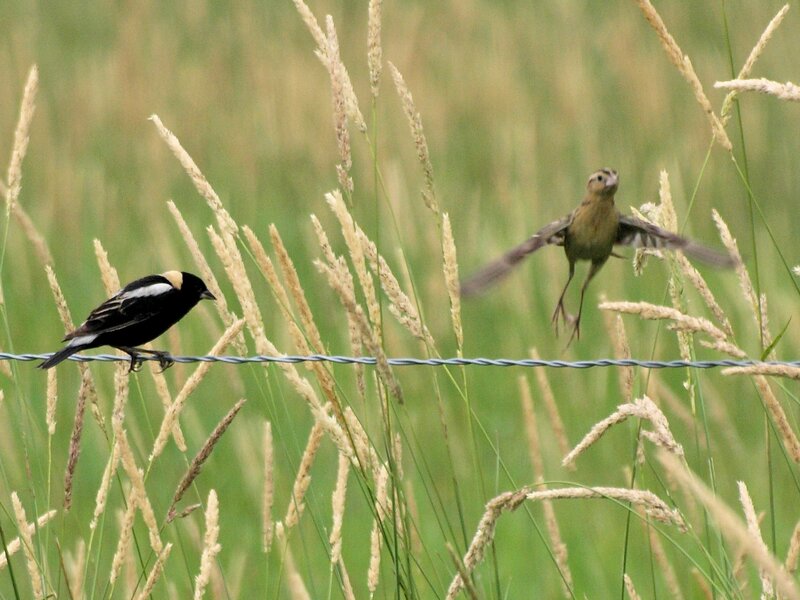 I love the way they fly and the sounds they make. 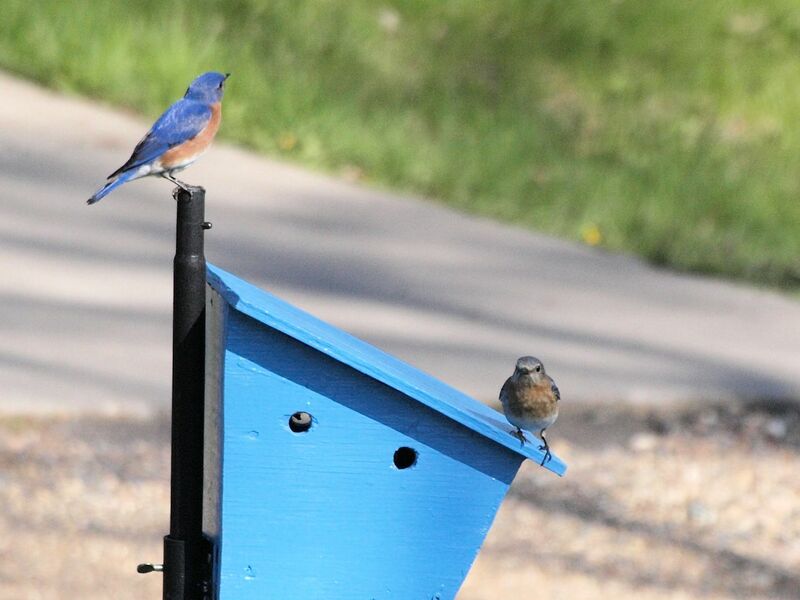 I am sure they will be migrating soon and will miss them. 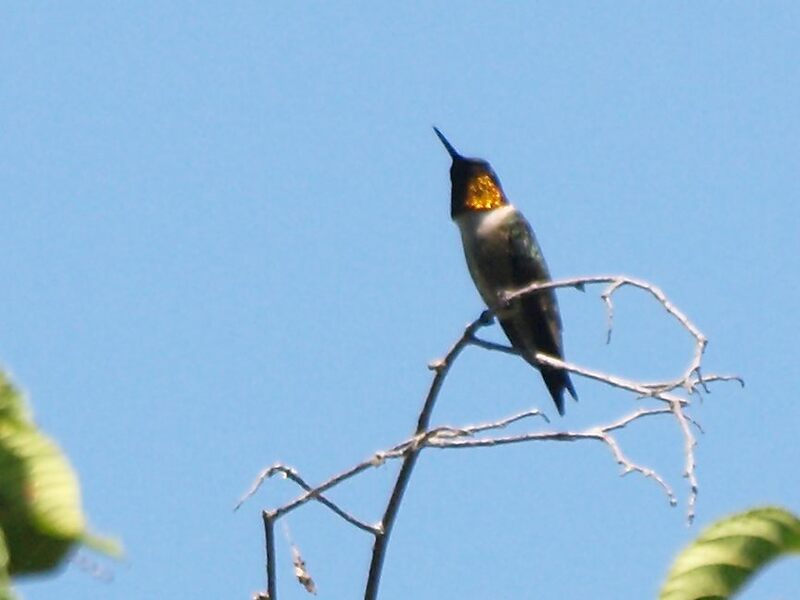 They have to be one of the most beautiful larger birds we get here during summer. Never can get enough of them! 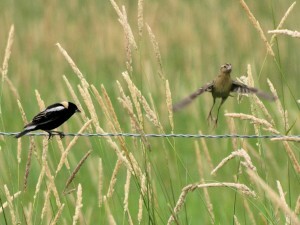 It was 88 degrees yesterday but that didn’t do anything to stop the oncoming start of Fall and with it, the Fall birds. In astronomical terms, fall starts with the Autumnal Equinox and this year it comes on September 23, 2011. 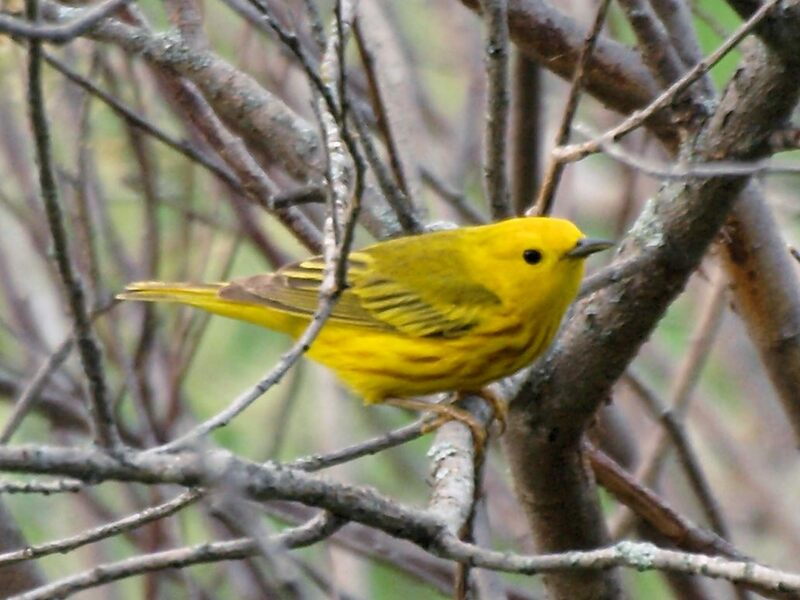 For birders in Minnesota, Fall starts in August once birds leave their breeding spots and start moving out prior that final migration. That is different for each species. 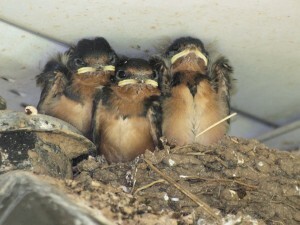 For example the Barn Swallow chicks left the next on July 26th, the brood stayed around for another month. 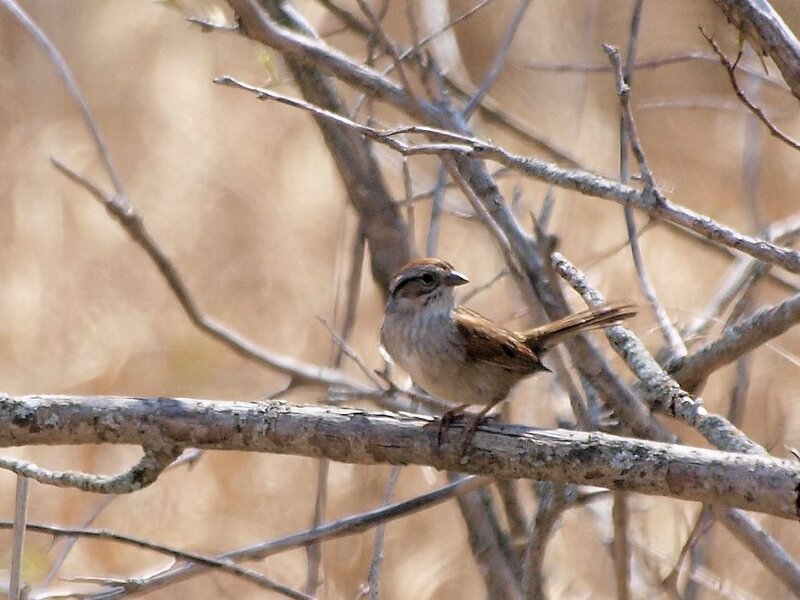 We keep a bird list, in the past it only included birds seen on days when we took bird trips of some kind, now we track every bird that we see (except for nasty birds like the House Sparrow). 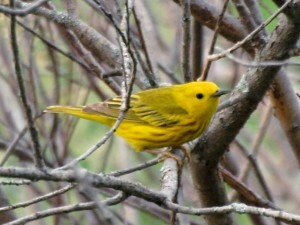 We can look back and see when each species last visited us. This year we haven’t seen the Robin since August 8th, last year we didn’t record any Robins in August but saw them in early migration in late September until early October. 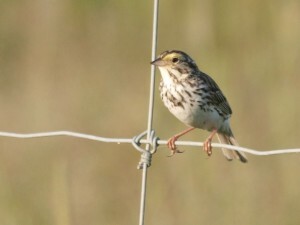 We are starting to get our first undeniable fall migrants. We saw a Gadwall yesterday. We saw a Pied-billed Grebe the say before. Loons are now in fall plumage. Redstarts are a bird that should be visible much of the summer but it isn’t quite as common at our location as I would have expected. We had some in late Spring until early July, but they were not visible until August. We didn’t see them last year at all after our move, so we don’t know how long we will have them here.